In Greek mythology Nyx was the goddess of the Night, and working with her husband, Erebus (Darkness), would bring a close to each day. Nyx was considered to be a dark goddess, and as a result, many “dark”, deities of the Greek pantheon were named as her children, with or without Erebus. The most famous listing of children of Nyx comes from the Theogony (Hesiod), and this work is the one most referenced when it comes to the genealogy of the Greek gods. Nyx was named as a Protogenoi (a first born deity) by Hesiod, and two of her children were also named as Protogenoi; these being Aether and Hemera. Strangely though Aether and Hemera were not “dark” deities, for Aether was air, and the source of the sky’s light, whilst Hemera was the Greek goddess of the Day. Each morning, Hemera would emerge from her cave-palace in the Underworld, and force Nyx and Erebus, back into their home, leaving Aether unobscured by night and darkness, thus bringing light to the world. Subsequent children of Nyx were not considered to be ​​Protogenoi, but these offspring included many famous deities. Hesiod would not name a father for these children, although later writers would assume that they were all born from the mating of Nyx with Erebus. 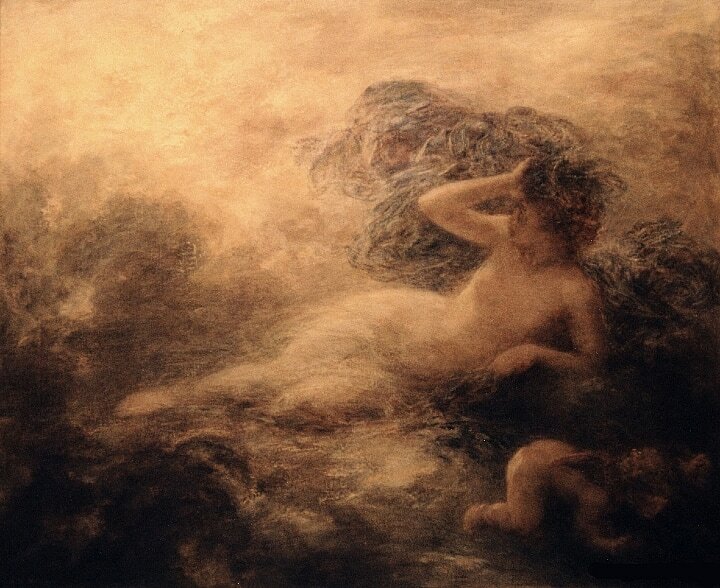 The Oneiroi – Nyx was said to be the mother of a thousand sons named the Oneiroi, the Greek gods of dreams, who would work hand in hand with Hypnos. Every night, the Oneiroi would emerge from the Underworld, and enter the thoughts of sleeping mortals. It would depend upon which exit from the Underworld that the Oneiori left through as to which type of dream the mortal would have, a pleasant one, or a nightmare. The Keres - Alongside the 1000 sons, Nyx was also mother to a group of 1000 daughters, the Keres. The Keres were the goddesses of violent and cruel deaths; thus, the Keres were often found upon battlefields, or where epidemics had broken, fighting over the souls of the deceased. The Moirai – One smaller group of children for Nyx were the Moirai, the Fates. The Moirai were three sisters, Atropos, Clotho and Lachesis, and working the with life thread of mortals, would plan out the lives of each from cradle to the grave. The Hesperides – According to Hesiod, the beautiful Hesperides were also daughters of Nyx. Normally numbering three, the Hesperides were the Greek goddesses of the Evening and Sunset, and so were logically linked with the Night. The beauty of these nymphs was not necessarily in keeping with the majority of other children of Nyx, and so many writers would instead call the Hesperides daughters of Atlas. Hypnos – Amongst the most famous of all children of Nyx was Hypnos, the Greek god of Sleep. Hypnos’ name of course lives on today in English words such as Hypnosis, but in Greek mythology Hypnos was considered to be a companion of his mother, bring rest each night to mortals, and as such resided in a cave in Tartarus near to Nyx. Amongst the most famous tales of Hypnos are those when he is put to use by Hera, as Hera attempts to put her husband Zeus into deep sleeps. Thanatos - Hypnos had a twin brother in the form of Thanatos, the Greek god of Death. Thanatos though was specifically the Greek god of non-violent death, for violent death was more the dominion of the Keres. Thanatos appeared regularly in Greek mythology for he was dispatched to take Sisyphus to the Underworld, before he was tricked by the king, and also Heracles would wrestle Thanatos to prevent Death from taking Alcestis away. Geras – In Greek mythology, another son of Nyx was Geras, the personification of old age. Normally portrayed as a decrepit old man, Geras showed the dichotomy of the virtue of achieving an old age and the pain and infirmity that ultimately came with it. Momus – Momus was a son of Nyx who originally did not live near to his mother, but instead resided upon Mount Olympus. Momus though, was the Greek god of Ridicule and Scorn, and so Momus was soon expelled from Mount Olympus by Zeus, after Momus had made fun of the other gods. Moros – Moros was the Greek personification of Doom, the god who drove man to the death that the Erinyes had planned for them. Moros might well have overrun the earth but for the fact that Hope remained when all of the evils escaped from Pandora’s Box. Eris – Another famous child of Nyx was the goddess Eris, the Greek goddess of Strife and Discord. Eris would be particularly associated with the Trojan War, and in many versions of the story, Eris was in fact to blame for the war, for she threw the Golden Apple of Discord at the wedding of Peleus and Thetis. This apple led to a dispute between Hera, Athena and Aphrodite which necessitated the Judgement of Paris. It was also said that everything that Eris was at the behest of Zeus. Nemesis – Another famous daughter of Nyx was Nemesis, the Greek goddess of Retribution. This was another daughter of Nyx who would work with Zeus, for Nemesis ensured that there was a balance to cosmos, where no man was supposed to be too happy or sad, or too lucky or unlucky. Apate – Apate was the Greek personification of Deception and Fraud, and arguably the male equivalent of Dolos. Apate would normally be found in the company of the Pseudologoi, the daughters of Eris, who were the goddesses of Lies. Oizys - Another daughter of Nyx was the goddess Oizys, the Greek goddess of Misery and Suffering. Philotes - Philotes was a daughter of Nyx who stood out from the majority of other offspring of the Night, for Philotes was the Greek goddess of friendship and affection, the opposite side of the spectrum to most of her siblings. Hesiod was of course not the only writer in antiquity to tell of the genealogy of the gods, and whilst many tell of the same children of Nyx as Hesiod, some also had names, whilst others also name other children which Hesiod told were offspring of other deities. In the Orphic tradition, Ouranos, the Greek god of the Sky was named a child of Nyx, although more commonly Ouranos was considered to be a child of Gaia (Earth). Similarly, in the Orphic tradition, the Astra Planeta, the gods of the Wandering Stars, were also children of Nyx, but again more commonly these gods were the children of Astraeus, the Titan god of the Stars, and Eos (Dawn). Similar contradictions occur with the naming of Hecate, goddess of magic, (Perses and Asteria), the Erinyes, The Furies (Gaia from blood of Ouranos), Deimos, fear, (Aphrodite and Ares), Ponos, hard labour, (Eris), Styx, (Oceanus and Tethys), Eros, love or procreation (Aphrodite or Chaos), Dolos, trickery (Aether and Gaia), and Eurphrosyne, one of the Charites, (Zeus and Euronyme), as children of Nyx. Occasionally, other children were named by these other sources where there were no contradictions including the goddess Eleos, personification of compassion, Sophrosyne, moderation, Epiphron, prudence, and Hybris, insolence; although, aside from Hybris, these deities were not in keeping with the dark nature of most children of Nyx. There were also many malevolent daemons talked of in antiquity, and these daemons often did not have any specific parentage, but because of the dark nature of them, were considered children of Nyx, including the likes of Anaidea (Ruthlessness), Epiales (nightmares), Achlys (death mist), the Arai (curses), Alastor (blood feud), Aporia (want), the Maniai (madnesses), Eurynomos (flesh eating daemon), and the Nosoi (plague).